To participate in the sustainable food movement today is to live on the edge of irony. Especially if you’re taking part in the movement from a seriously urban setting like, say, Washington, D.C.
What do I mean by this? Just look at this summer. Over the past few months, I’ve taken digital pictures of my hands covered in garden soil, emailed for advice on thinning carrots, Googled rustic local farms, and watched a documentary about real food from a plastic seat in an air conditioned theater. It’s not just me. Recently, more and more small farms, local food organizations, and gardeners have set up blogs or created Facebook groups. It seemed fitting that the first cooking experience I chose to “tweet” was a process as old as cooking itself. That is to say, I used a high-tech virtual gizmo known as Twitter to talk about making bread. Let me walk you through it, oh internet reader, and see if I can’t inspire you to take a break from the keyboard and get your hands doughy. This is a very simple recipe. It’s also nearly fool-proof, I think, because the sugars and yeast in the beer help the dough to rise. Try this with the whole wheat flour now available from Moutoux Orchard and beer from a local brewery. (See more detail on finding the ingredients in my Examiner.com version of this recipe). Once you’ve made the recipe once with the full directions, try using the tweets as shorthand guidance for your next attempts. Made a sponge of water, yeast, and flour. Waiting for it 2 bubble! In a large mixing bowl, combine ½ c. water, 1 packet (about 2 ¼ tsp.) 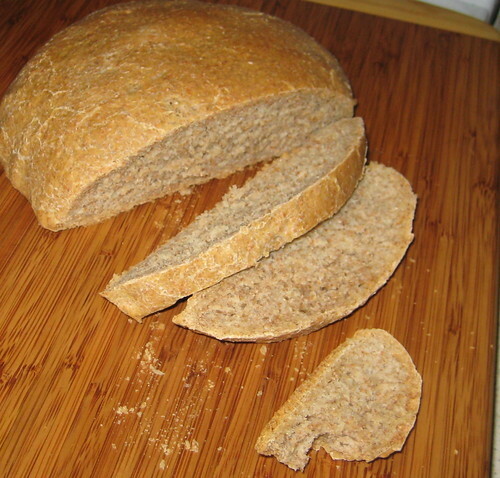 active dry yeast, and ¼ c. unbleached bread flour. Allow to sit in a warm place until a yeast-inspired bubbles break on the surface. Kneeded yeast, water, flour, salt, porter. Dough’s rising. To the bubbly sponge, add 1 tsp. salt, 2 c. unbleached bread flour, 2 c. whole wheat flour, 2 Tbs. olive oil, and ¾ c. (half a bottle) beer – a porter, IPA, or other dark or hoppy beer. Mix ingredients until they form a firm dough, adding more flour or beer if necessary, and then turn out onto a floured counter or cutting board. Kneed for a few minutes. Rinse and dry the bowl, then oil the sides. Form the dough into a smooth ball, and place the dough in the bowl. Cover with a damp cloth or plastic wrap and let sit in a warm place to rise for about an hour, or until doubled in size. 1st rise done! Divided the soon-to-be beer bread into 2 loaves for a 2nd. With a sharp knife, slice dough into two equal parts. Form each into a ball and place on lightly oiled cookie sheet or loaf pans. Cover with plastic wrap and allow to rise another hour. Oven’s ready @ 350. Baking the loaves. Preheat oven to 350 F. Bake bread (remember to remove the plastic wrap!) for 45-55 minutes, or until a knock on the bottom of the loaf produces a hollow sound. Beer loaf is done! I made bread w/o putting stuff in a machine! Beer loaf is done! You made bread without putting stuff in a machine! Now all that’s left is to allow the bread to cool on a wire rack or perched on top of the loaf pan, then slice it up and eat warm with butter. You may now return to your regularly scheduled emailing, tweeting, or photo uploading–well, maybe after one more slice. This entry was posted in Recipes, Technology and tagged baking, beer, bread. Bookmark the permalink. Ok Rhea, I’ve got a challenge for your food guru self. I have some unidentified squash – summer variety – that I’ve tried to use but not found to be to my liking. Is it the squash itself or is it the limited methods I’ve tried to use to prepare it? Feeling like it is probably the latter, I’d like to know what you would do. Can you make something delish from these unidentified varieties? I’ve got two of these squashies, fresh from my garden. All organic, local, and natural – this should be right up your alley. [Well, I think it’s organic (the seeds I bought don’t specifically say that… but my garden is au-natural).] These two veggies were grown from seeds with latin name “Cucurbita pepo”, a seven variety pack that says it produces various varieties of zucchinis, crookneck and straightneck squash. BUT, what I have doesn’t exactly match the picture. Also in the garden are butternut squash and spaghetti squash , but this looks like neither of those. I’ve also got more blossoms than will likely produce before the frost. So gathering some of those for an accompanying dish might be possible as well. I’ve never tried to do anything with the blossoms yet. I think this may be above my current culinary level.